A spinal disc herniation, commonly called a “slipped disc”, is a medical condition affecting the spine. 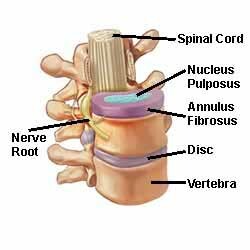 A disc herniation is when a tear in the outer, fibrous ring (annulus fibrosus) of an intervertebral disc allows the soft, central portion (nucleus pulposus) to bulge out. Decompression is one of the most popular methods of treatment. We have had great success over the years. 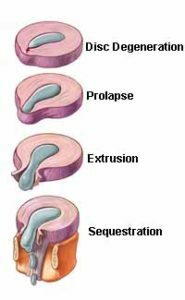 It is normally a further development of a previously existing disc protrusion. This is a condition in which the outermost layers of the annulus fibrosus are still intact. But it can bulge when the disc is under pressure. This can be extremely painful. As you can imagine. Disc herniation can occur in any disc in the spine. But the two most common forms are the cervical disc herniation and the lumbar disc herniation. The latter is the most common. This causes lower back pain (lumbago) and often leg pain as well. In that case it is commonly referred to as sciatica. Lumbar disc herniation occurs 15 times more often than cervical (neck) disc herniation, and it is one of the most common causes of lower back pain. 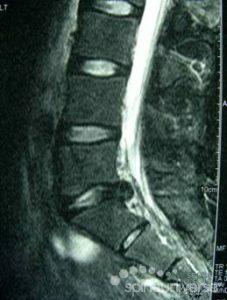 Cervical discs are affected 8% of the time. And the upper-to-mid-back (thoracic) discs only 1 – 2% of the time. The following locations have no discs and are therefore exempt from the risk of disc herniation: the upper two cervical intervertebral spaces, the sacrum, and the coccyx. Most disc herniations occur when a person is in their thirties or forties when the nucleus pulposus is still a gelatin-like substance. With age the nucleus pulposus changes. It dries out. Therefore the risk is greatly reduced. At the same time osteoarthritic degeneration makes its inroads. Cervical disc herniations occur in the neck, most often between the sixth and seventh cervical vertebral bodies. Symptoms can affect the back of the skull, the neck, shoulder girdle, and the scapula. Symptoms can also produce shoulder pain, arm pain, and hand pain. Thoracic discs are very stable and herniations in this region are quite rare. Herniation of the uppermost thoracic discs can mimic cervical disc herniations. Meanwhile herniation of the other discs can mimic lumbar herniations. Lumbar disc herniations occur in the lower back. Most often this is between the fourth and fifth lumbar vertebral bodies or between the fifth and the sacrum. Symptoms can affect the lower back, buttocks, thigh, and may radiate into the foot and/or toe. The sciatic nerve is the most commonly pinched nerve. So it causes symptoms of sciatica. The femoral nerve can also be affected. Therefore the patient can experience a numb, tingling feeling. This will be throughout one or both legs. And it can even reach into the feet. Causes of a disc herniation can include general wear and tear on the disc over time, repetitive movements, stress on the disc that occurs while twisting and lifting, or other injuries. While the chief complaint for spinal disc herniation is lower back pain, symptoms of a herniated disc can vary depending on the location of the herniation and the types of soft tissue that become involved. So they can range from little or no pain. This can lead to severe and unrelenting neck or back pain. Sometimes that will radiate into the regions served by an affected nerve root. Other symptoms may include sensory changes such as numbness and tingling. It can also cause muscular weakness or paralysis. The pain is not pulsating pain. Pain from a herniated disc is usually continuous. It is possible to have a herniated disc without any pain or noticeable symptoms. That depends on its location. So if the extruded nucleus pulposus material doesn’t press on soft tissues or nerves, it may not cause any symptoms. It has been estimated that as much as 50% of the population have herniated discs in their cervical region that do not cause noticeable symptoms. Symptoms are usually experienced only on one side. Sometimes the prolapse is very large. So it presses on the spinal cord or the cauda equina in the lumbar region. That can affect both sides of the body. This is often with serious consequences. Diagnosis is made by a practitioner based on the history, symptoms, and physical examination. At some point in the evaluation, tests may be performed to confirm or rule out other causes of symptoms. Some of these include spondylolisthesis, degeneration, tumors, metastases and space-occupying lesions as well as evaluate the efficacy of potential treatment options.